ebm-papst believes that experience-based learning is the best way to get our kids excited about science and technology…and have a blast along the way. Every year, our company and its employees devote time, resources and expertise to turning this belief into reality. Along with like-minded organizations including United Technologies, General Dynamics-Electric Boat, Northeast Utilities and our state’s leading universities, we support high-school level FIRST Robotics Competition (FRC) teams as they conceive, design, build, program and test robots that compete regionally and nationally. FIRST stands for “For Inspiration and Recognition of Science and Technology.” This year’s FIRST Robotics Competition Connecticut Regional, sponsored by UTC, was held March 29 and 30 at the Connecticut Convention Center. To get ready for the competition, ebm-papst manager Hogan Eng devoted nights and weekends to helping Woodbury’s FIRST Robotics Competition (FRC) Team 2836, Team Beta at Nonnewaug High School. 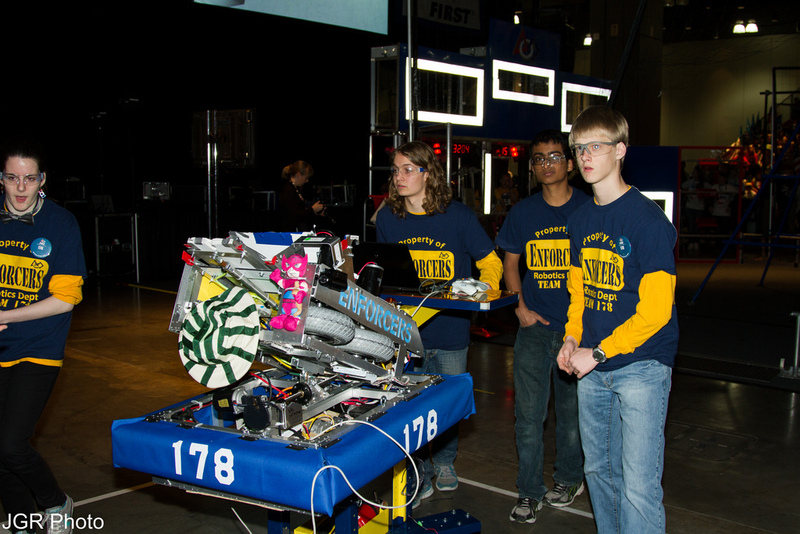 Meanwhile, manager Bill Aston mentored Farmington High School’s FRC Team 178, the 2nd Law Enforcers. Hogan and Bill’s involvement with the two FRC Teams is backed by employees Matt Crossman, Dale Watson, TJ Swistro, John DMarco, Bruce Thibodeau, Tom Shimeld and Mike Warner who each contribute their engineering and manufacturing expertise to the two teams’ robots. Together, ebm-papst’s engineering and manufacturing experts help students on the two teams master science and technology concepts while gaining valuable career and life skills that are carrying them to higher education and STEM-based careers. So how did the two teams fare at the CT Regional? Rebecca DiSarro, a member of Team Beta, was named Connecticut’s finalist for the FIRST Dean’s List. FRC Team 178, the 2nd Law Enforcers, received the CT Regional Competition’s Engineering Inspiration Award. Tim Barron, lead mentor for Team 178, received the Woodie Flowers Finalist Award for Connecticut. Stay tuned for our next blog, where we catch up with Hogan, Bill and the ebm-papst team as they talk in depth about this year’s competition, the game, Team Beta and the 2nd Law Enforcers.